After my email and blogpost about the UBA and it’s paper magazine I received a reply from Rik ON7YD who said the board members of UBA are really aware of this problem and they are looking for a solution. Because some people misuse all information about the UBA I will not get into the details of this in public. As soon as the different possibilities have been studied the UBA will of course publish how it will react to this problem. The least I can say is that I am happy with the emails I received from the UBA and that this matter is under study. Hey guys, before you react, please read (and understand) what I have written! And if you don’t understand after reading twice, please ask me about what I meant. Moreover, if you have anything to say please say it to me directly. (Click on the ‘comments’ link). Today I received a very constructive reply from ON7YD ant ON7TK to my email concerning mainly the paper magazine of the uba. Unfortunately some people seem to use my ‘open’ letter to stir up the war between the different radioamateur associations in Belgium. For those who don’t agree with the things I write, you can always reply to me directly or on the blog. No need to only send emails to your friends about it. And let me state this again: IF ALL THE ENERGY YOU GUYS HAVE PUT IN THE WAR BETWEEN THE NATIONAL ASSOCIATIONS IN BELGIUM DURING THE LAST TEN OR FIFTEEN YEARS HAD BEEN USED FOR PROMOTING AND PROTECTING HAM RADIO IN BELGIUM, TODAY IT WOULD BE A LOT EASIER FOR ALL OF US TO PUT UP TOWERS AND ANTENNAS WITHOUT ALL THE ADMINISTRATIVE HASSLE WE GET NOW. To UBA or not to UBA? A few days ago I received an e-mail from Rik ON7YD to ask me to pay the yearly membership fee for the UBA. Since a few years they send out these e-mails a few weeks before they send out letters to all members. For those who pay before the letters are sent out they can spare some postage. Should someone need a translation of the above, let me know. Message for the UBA: please get rid of the paper CQ-QSO, it is a HUGE waste of valuable money. All of your members have an internet connection so PDF is ok! 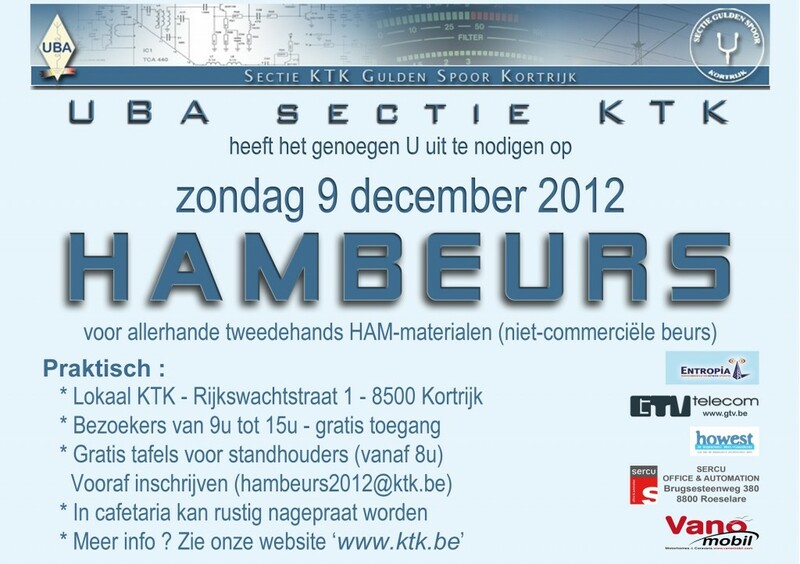 With the money gained you could lower the membership fees and invest some more in promoting and defending HAM radio in Belgium!